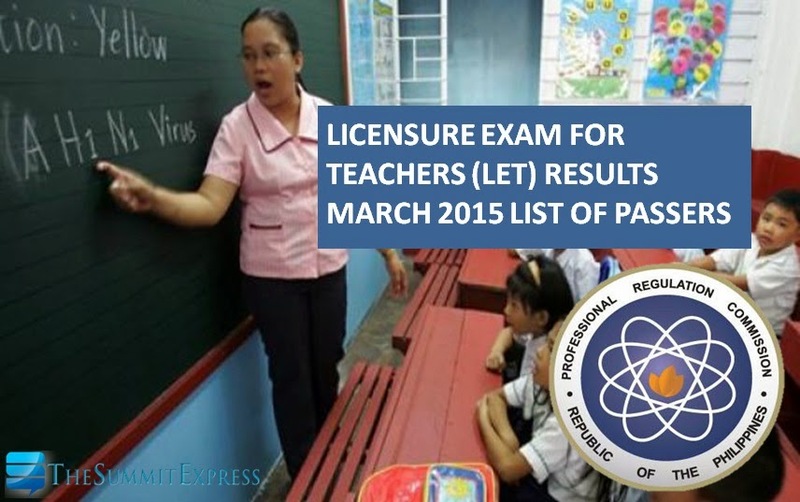 Those awaiting results of March 2015 licensure exam for teachers (LET) or teachers board exam may can here the complete list of passers, top 10 (topnotchers), top performing school and performance of schools as the Professional Regulation Commission (PRC) and the Board of Professional Teachers (BPT) released official results on Saturday, May 23, 2015 or in 38 working days after the exam. PRC announced that 12,103 elementary teachers out of 44,144 examinees (27.42%) and 17,904 secondary teachers out of 56,596 examinees (31.63%) successfully passed the Licensure Examination for Teachers (L.E.T.) given last March 29, 2015 in Singapore and 17 testing centers all over the Philippines. It is further announced that of the 12,103 elementary teacher passers, 5,607 are first timers and 6,496 are repeaters. For the secondary teachers, 11,770 passers are first timers and 6,134 are repeaters. LET was conducted on Sunday, March 29, 2015 in the following test centers nationwide: Manila (NCR), Baguio, Cagayan De Oro, Cebu, Davao, Iloilo, Legazpi, Lucena, Pagadian, Tacloban, Tuguegarao, Catarman, Jolo Sulu, Bongao Tawi-tawi, Catanduanes, San Jose, Antique and Zamboanga. The BPT is composed of Dr. Rosita L. Navarro, Chairman; Dr. Paz I. Lucido, Dr. Paraluman R. Giron and Dr. Nora M. Uy, Members. The examination for teachers consists of two parts for Elementary: General Education (40%) and Professional Education (60%) and three (3) parts for Secondary: General Education (20%), Professional Education (40%) and Specialization (40%). The exam covered the major areas of GE (English, Filipino, Mathematics, Science and Social Sciences subjects), PE (teaching profession, social dimensions of education, principles of teaching, education technology, curriculum development, facilitating learning, child and adolescent development, assessment of student learning, developmental reading, field study and practice teaching). The 10 specializations for Secondary Teacher with exam coverage depends on the chosen course: English, Filipino, Biological Sciences, Physical Sciences, Mathematics, Social Studies or Social Sciences, Values Education, MAPEH, Agriculture and Fishery Arts and TLE (Technology and Livelihood Education. In order to pass the LET, an examinee must get an average rating of not less than 75% and must have no rating lower than 50% in any of the subjects. TheSummitExpress and our partner exam results portal PRCBoardNews expect March 2015 LET board exam results release between May 11 (Monday) to May 22, 2015 (Friday) or in 27-36 working days after the exam. The projected date excludes weekends and holidays on April 2 (Maundy Thursday), April 3 (Good Friday), April 9 (The Day of Valor) and May 1 (Labor Day). According to PRC Resolution No. 2014-874, the target release of results is after 31 working days or in May 15, 2015. In March 2013 exams, official results were released in 27 working days. A total of 10,310 elementary teachers out of 37,117 examinees (27.78%) and 15,223 secondary teachers out of 38,433 examinees (39.61%) successfully passed the LET. In January 2014, results became available online after 32 working days. PRC named 11,120 elementary teachers out of 38,377 examinees (28.98%) and 12,033 secondary teachers out of 42,358 examinees (28.41%) who passed the tests. In the past teacher board exams, TheSummitExpress has delivered all the important updates before the release of results. Takers can expect on this page some major updates for March 2015 teachers board exam. May 12, 2015 Update: Dr. Carl E. Balita of CBRC has shared on Facebook that LET results are out in just few days from now. Rumors said results to be released on Friday, May 15. May 21, 2015 Update: Source says results are out SOON. May 22, 2015 1st Update: Last day of waiting for the results? Balita posted "This is the day the LORD has made." May 22, 2015 2nd Update: PRC official told TheSummitExpress that the members of the Board of Professional Teachers (BPT) are currently in quarantine for the processing of exam results. Only the BPT has the information of the exact date and time of posting LET results. May 23, 2015 Update: Results now out!